I seem to be on a soup binge lately and find myself making two or three new soups every week. Although we do have a number of favorite soup recipes, I am always thinking of new ones to try and so we do not often eat the same soup more than once a month. 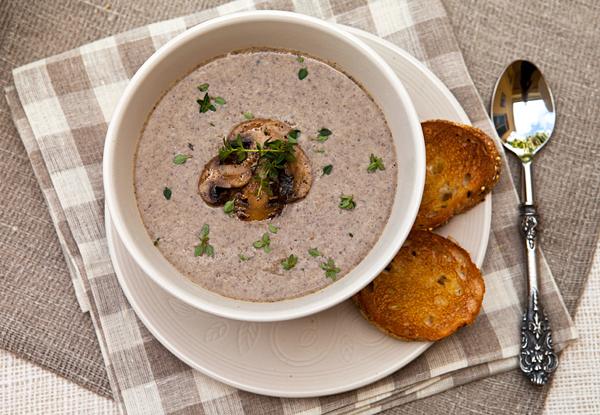 We do love soups though, and often enjoy a big bowl of soup for lunch, although soups like this delicious creamy mushroom soup are also great served as a first course for a special weekend meal or when entertaining. This easy soup is full of mushroom flavor as the mushrooms are roasted first before the rest of the ingredients are assembled. I used a combination of mushrooms which are sold as a wild mushroom mix at my local specialty store, but you can use any combination of mushrooms that you prefer. I used fat free half and half along with half a potato to help create a creamy texture without added fat, and I kept the garnish on the soup simple, topping each bowl with some sautéed mushroom slices as well as some fresh thyme. Other garnish ideas to consider would be toasted slices of crusty bread topped with goat cheese, or crumbled crispy pancetta bits. Since I make a couple of different soups every week anyway, when I heard a couple of food bloggers were hosting a soup challenge this month, I knew I had to join in the fun. I decided to make this soup as my contribution in the SoupaPaooza fun, a soup challenge hosted by TidyMom & Dine and Dish blogs. This soup is made creamy without added cream by substituting fat free half and half as well as potato. Mushrooms are an excellent source of selenium – more than any other produce. They are also a source of B vitamins, potassium and fiber. A creamy textured soup made with roasted mushrooms. Place the mushrooms and onions on a large baking sheet and drizzle with the olive oil. Toss the mushroom mixture with the oil, season with salt and pepper, and roast for 20 minutes. Stir the mushroom mixture and add the garlic, stirring to mix, and continue to roast another 10 minutes. Place the mushroom mixture into a stock pot along with the chicken broth, thyme, and diced potato. Bring to a boil, then reduce the heat to a simmer and cook until the potato is soft. Taste, and adjust salt and pepper. Use an immersion blender to puree the soup until smooth. Return the soup to the pot, and add as much half and half as desired. Keep the soup warm until needed. 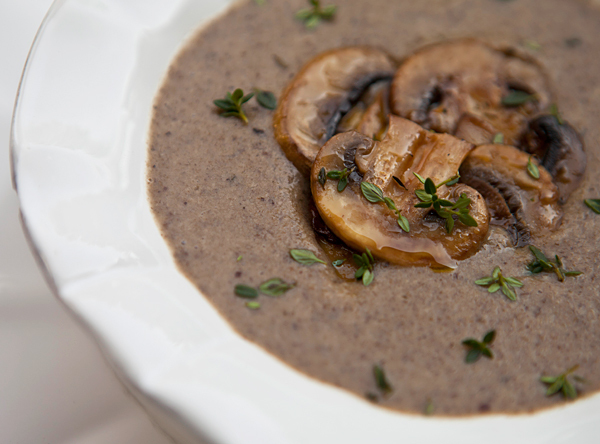 Serve the soup into individual bowls garnished with the mushrooms and fresh thyme leaves.